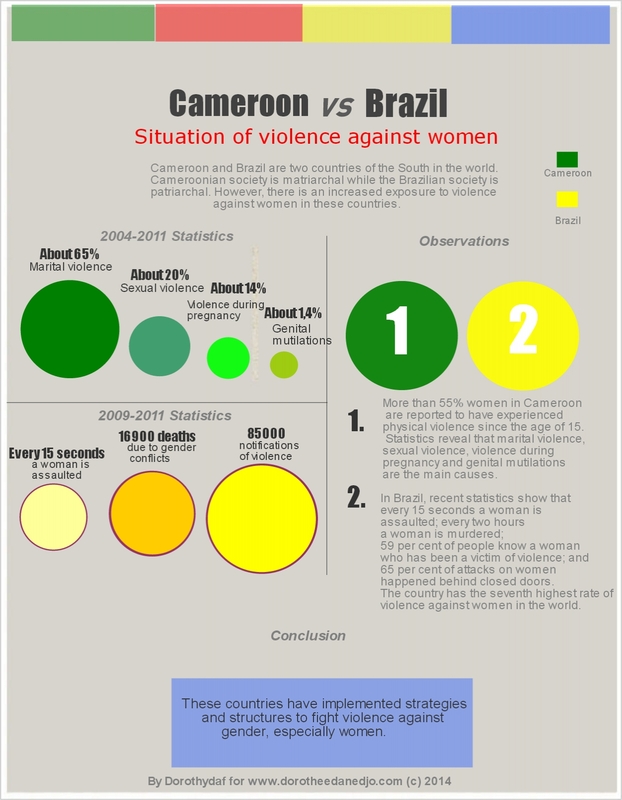 Sources: Statistics of 2004 and 2011 in Cameroon and Brazil Embassy in Cameroon. To solve this social problem , the two countries have established appropriate ways out of crisis according to their context. In Cameroon, for example, the plan put in place to combat such violence against women is at the same time preventive, protective and repressive. It should be noted that during the development of diagnosis of the two countries in the field of gender violence, statistics and data on women are more accessible. Officials do not comment exactly the information about violence against men. However, they say that « there are many men who are victims of violence due to women » and that women « certainly suffer violence but they are also cause of this violence » especially in schools. By searching online data on violence against men, a study published in 2008 by the CRED (Centre for Research on the Rights and Duties of the Human Person), a Cameroonian NGO, found that men are also victims. . The gender-based violence is a real problem of society where male consideration should also be taken into account in policy decisions making. Ce contenu a été publié dans Articles, avec comme mot(s)-clé(s) blog camerounais, Brazil, Cameroon, cameroonian blog, data investigation, data journalism, datajournalism, Dorothée Danedjo Fouba, dorotheedanedjo.com, dorothydaf, onufemmes cameroun, statistics, violence against gender, webjournalism. Vous pouvez le mettre en favoris avec ce permalien.